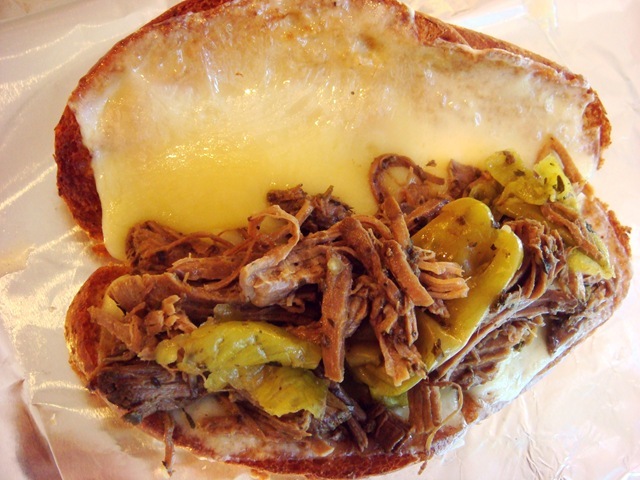 This is a fabulous shredded beef sandwich recipe from Pioneer Woman. She cooked hers in a dutch oven, but I did mine in a crock pot. And I started with a completely frozen roast from my deep freeze. I put everything in the crock pot just before going to bed on a Saturday night, and it was all ready to serve after church on Sunday. It couldn’t have been easier! 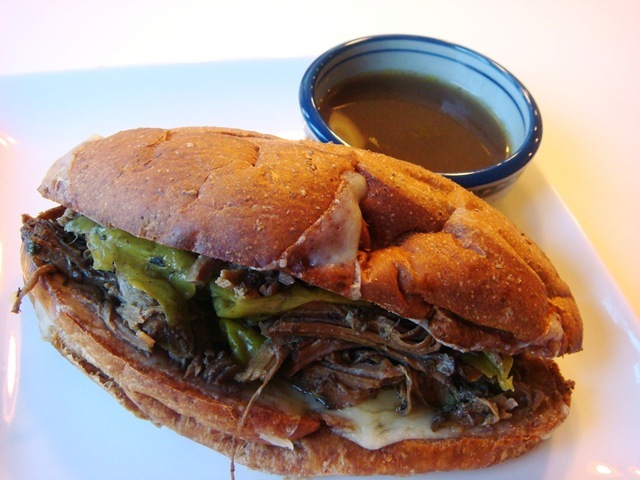 A beef roast (any variety), a jar of pepperoncini peppers, Italian seasoning and beef broth. That is the simple cast of characters. The vinegar from the peppers gives this beef a fabulous tanginess. And these peppers are not spicy, so the whole family will love it. Just before serving, toast up some buttered, cheese topped deli rolls. Top rolls with your shredded beef and peppers. Serve your sandwiches with a small bowl of juices from the crock pot for a fabulous dunking sandwich. Just don’t forget the napkins! Combine all ingredients (except rolls, butter and cheese slices) in a crock pot. Do not drain pepperoncini-pour entire jar into the crock pot. 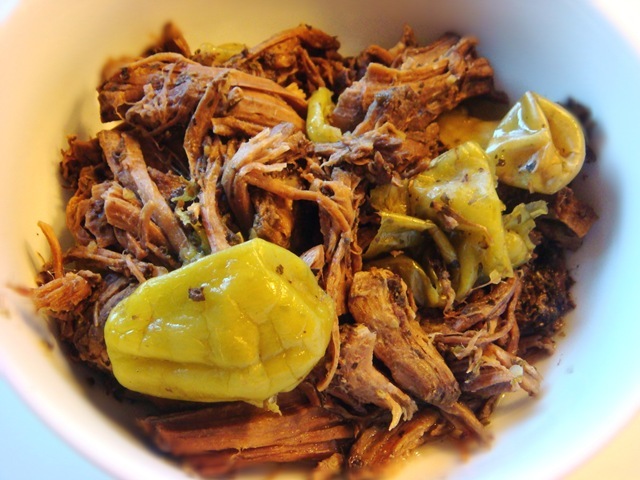 Remove roast from crock pot and place in a large bowl. Discard any large fat pieces. Use two forks to shred the meat. Remove pepperoncini from the crock pot and stir into shredded meat (I like to remove the stems from the peppers at this point, but that is optional). If desired, strain remaining liquid in the crock pot, reserving the strained juices. Slice rolls almost in half. Open rolls and place on a foil-lined baking sheet. Spread with butter. Toast at 400°F for about 5 minutes, or until rolls are slightly crispy but not overly brown. 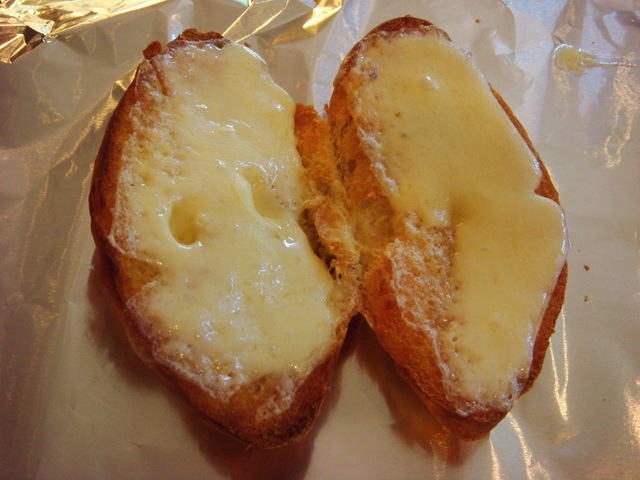 Top with cheese slices and return to oven until cheese melts—watch carefully so that you don’t burn the rolls! Serve meat and peppers on the toasted rolls with a small bowl of the juices for dipping. I love it!! Frozen roast to dinner the next day..what could be better. Looks delicious. This is wonderful!! My entire family loved it. Thanks for sharing. Just wondering…I made this for my family today. Did the beef taste a little pickled from the pepperocinis? I love the flavor, but my family was not too excited about it. The sauce does have a tang from the vinegar in the pepperoncini jar, but our family really enjoys that tang. I have even found kids looking for other things to dip in their leftover jus after their sandwich is gone. 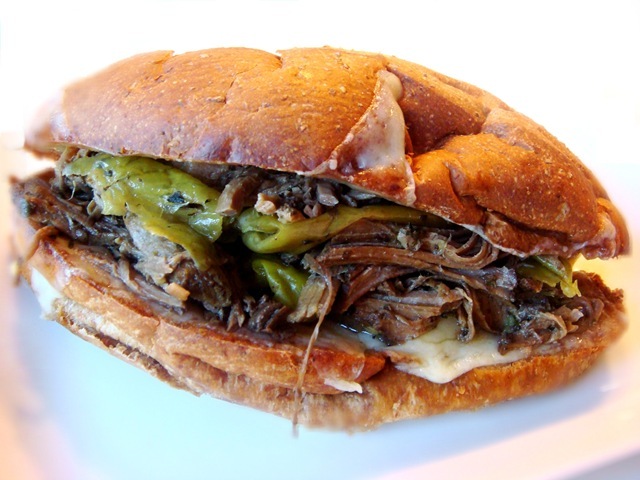 If you decide to try again, you could drain the liquid from the pepperoncini jar before adding it to the beef. Different brands of pepperoncini may also have different vinegar strengths. I usually use the Mezzetta brand. I though at first this recipe was a little bland, but after a tiny bit a tweaking with some seasoning, we absolutely loved it! My husband was pleasantly surprised as well. Great dinner! We loved this recipe!!!!! Had it tonight and everyone kids included LOVED IT! I also added some garlic powder and Kalamata olives. We used a fresh roast on low and ate it at 5 1/2 hrs. This is going to be a crock pot dish I will be making often. Thanks for sharing!!! I’m glad you enjoyed it. Kalamata olives would make a great addition! Is that 1/4 cup of Italian seasoning ( as in about half a seasoning jar) or Italian dressing? That is Italian seasoning the herb blend, not the dressing. I buy the big jars at Costco! You can use less, and it won’t affect the taste much.